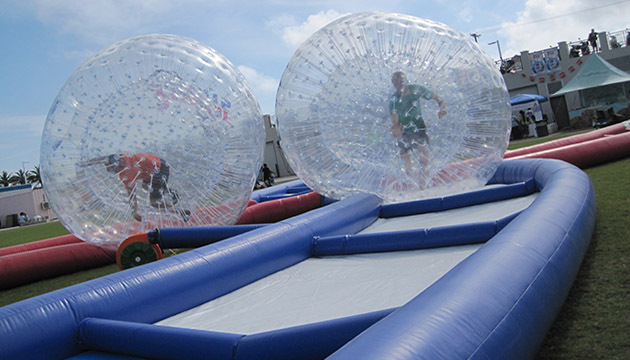 BIOS staff teamed up for an unusual lineup of sports that included launching down slip-and-slides and racing while inside huge plastic balls during an April 9 corporate team-building event at the National Sports Centre. 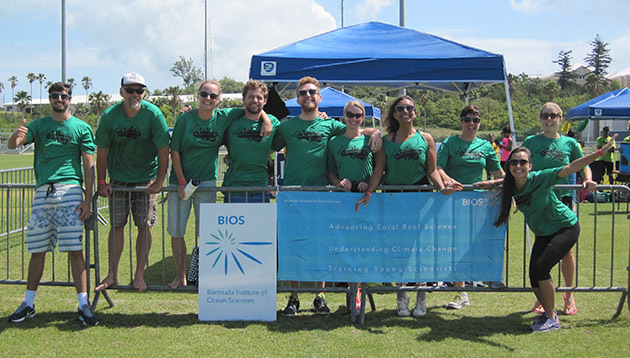 Good-natured participants from BIOS included (from left) Afonso Goncalves, Alex Hunter, Rebecca Garley, Matt Hayden, Sam Stevens, Carolyn Drake, Chloe Baron, Kyla Smith, Luna Hiron, and Julia Matheson. BATS research technician (on right) Sam Stevens took it for the team inside an inflatable ball pushed by BIOS team members. More than a dozen corporate teams from the island competed in the event.